During WWI and WWII, people grew Victory Gardens. It was a good PR move, helping people feel like they could ease the burden of feeding the country by growing food of their own. In 2008, the term Recession Garden came about. 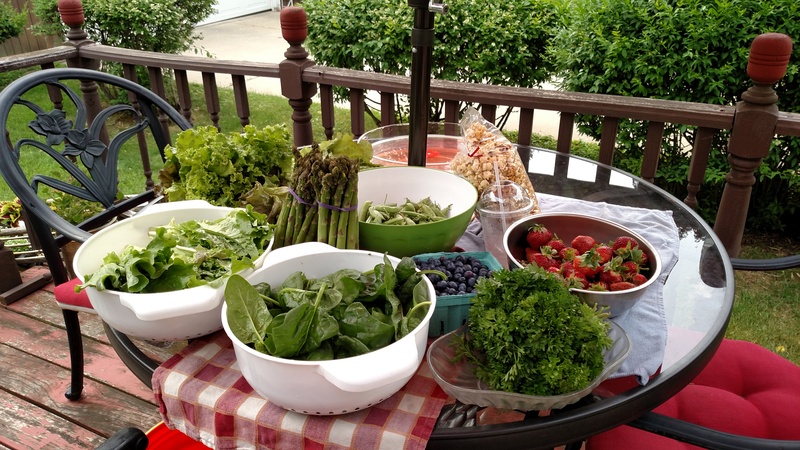 Planting a garden in the backyard, on the apartment balcony, or anywhere there was room for a container helped provide fresh food for the family, even if the country’s economy was shaky. And now, just when I thought I’d heard every trendy excuse to grow your own tomatoes, there’s a new term: a Climate Victory Garden. By tilling – or not tilling – a small plot, gardeners have a chance to use their efforts as a force for change. It isn’t my original idea; the concept comes from Green America by way of Mother Nature Network. I like their philosophy; they encourage composting, planting perennials (does my rhubarb count? ), avoiding chemicals, and covering soil with mulch to maintain temperature and moisture. As I said, it isn’t my idea. In fact, I hesitate to put another trendy label on my containers and the approximately 32 square feet with mostly vegetables growing there. Victory Garden, Recession Garden, or Gardening for Climate Change, it’s a garden. It’s not dirt, it’s soil. It’s tilled, compost added, watered, mulched (well, when I get time). But don’t call my little backyard effort anything trendy. It grows vegetables. It’s a garden. Period. 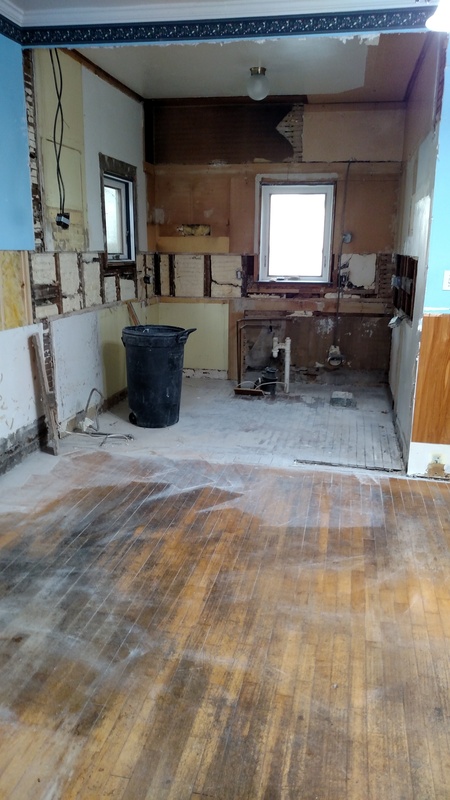 This kitchen project has been consuming us since…since…oh, at least since December. And finally, finally, it’s happening. The guys were here today. 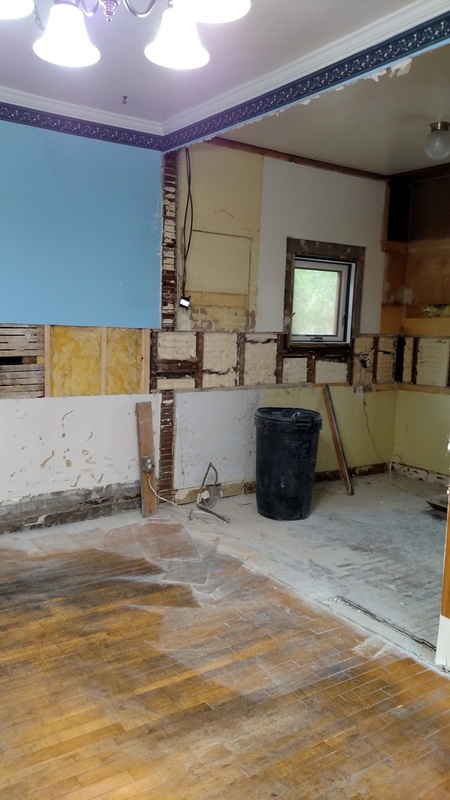 They hung a plastic tarp so the dust didn’t fly all over the house (it only piled up in the dining room), and they did demo. Big time. I can show you better than I can tell you, though. And that’s that. Nothing left. No sink, no stove, no dishwasher. And that’s where my good old Girl Scout ingenuity came in. We might go to paper plates sooner or later, but Daisy the Compostermom isn’t ready to go there yet. 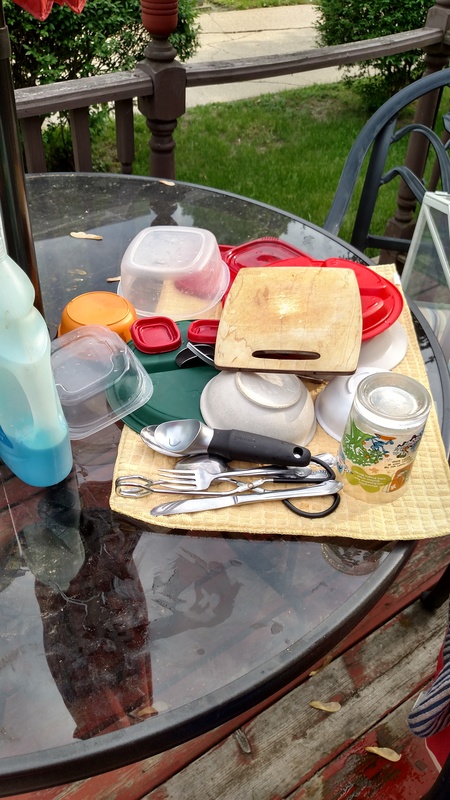 I washed dishes the way I learned at Girl Scout camp, minus the dunk bag. 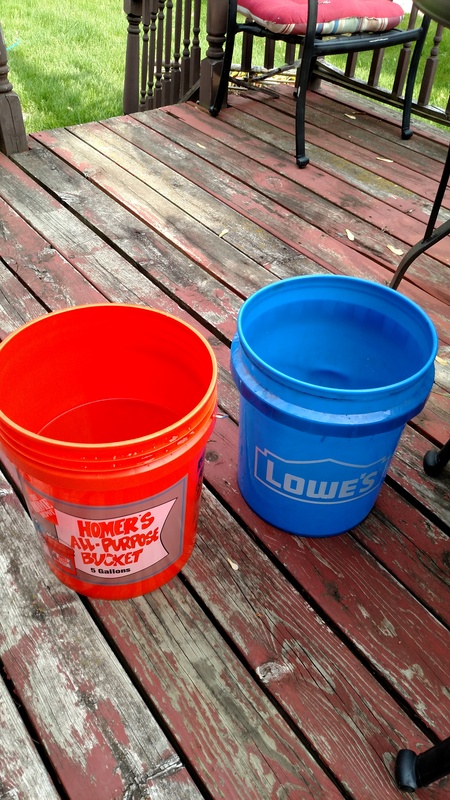 One bucket with water and dish soap, one with hot water for rinse. Air dry for a bit, and then we’re done. And Chuck was surprised I found the dish soap under the bathroom sink? Hah. I’ve only just started to show my coping skills. To Swap, or Not to Swap? I had plans. Big, exciting plans. I was going to go to a seed swap and seedling sale on Saturday morning before The Boys (Chuck and Amigo) were even awake. Then the blizzard arrived. And not just any blizzard: the blizzard that broke records, records in snow-is-the-norm Wisconsin. So I didn’t get to the seed swap and seedling sale. Honestly, it may have been cancelled. So much was closed, so many events cancelled, that I don’t even know if the park or the nature center was plowed. In fact, we were at the meat market watching a chef pick up $500 worth of meat for his restaurant when his wife called him to say the staff couldn’t get in and they were closing. I wasn’t planning on bringing seeds to swap, if I’m honest with myself. I had been thinking about buying seedlings and nurturing them indoors through the blizzard and the early spring that might happen, maybe, someday. I don’t have many seeds, or at least not unique seeds. Or do I? I have butternut squash, parsley, and dill, all salvaged last fall. Those are such common seeds that I wouldn’t bother to offer them up as a swap. However, when I found myself in the garage after cleaning and emptying a litter box in the middle of the storm — oh, let me start over without the drama. Bunny’s litter box needed cleaning, so I walked through the garage to dump the waste/fertilizer on top of the snow in the backyard patch. On my way back through the garage, I grabbed a packet of seeds for sweet banana peppers. As long as I was there, I dug through the empty pots on my planting table to find milkweed. On my way to the milkweed, I realized I had saved more than I’d remembered. I searched through yarrow, chamomile, yellow beans, feverfew, baby’s breath, and (how could I forget?) walking onion bulbs! The ending of the story is this. I didn’t go to the seed swap and seedling sale – if it even happened. But I did find more seeds that I could start right now – right now! – and nurture under my grow lights until spring really arrives. I ordered seeds. I brought a bucket of potting soil in the house. Next: start the tomatoes and peppers. Oh, the herbs, too. I kind of let those dry out and die from neglect. Tomatoes, and perhaps the peppers, too, will grow in containers this year. I have a few already. Then when we discovered a new-to-us store full of collectibles and vintage goodies, I found three more pots big enough for tomatoes. Yay! Last year was a rough year for tomatoes. I bought a lot of tomatoes and peppers from the farmers markets. The cause might have been weather, cold temperatures at all the wrong times, lack of rain when we needed it, too much rain when we didn’t, you know the drill. Tomatoes, however, can drain the soil of its nutrients. I wondered if I’d planted tomatoes and peppers just one summer too many, and the soil just had nothing to give. My solution is this: tomatoes in containers for a year. They’ll have fresher soil in the pots, and the garden soil can replenish itself with the help of organic material (compost! Yeah!) and some interim “crops” like beans and peas. It’s still winter, though. March came in like a confused animal, neither lion nor lamb, so I have no idea how the rest of the time from now until spring might unfold. New England is getting hit with another nor’easter, as the Weather Channel says. Closer to home, Minnesota might see a major snowstorm soon. Here? Who knows? In Audrey Hepburn’s words, “To plant a garden is to believe in tomorrow.” Planning that garden and starting seeds in winter – now that’s faith. Your customer service has improved light years. We are greeted by name. Your staff is polite and eager to help out. Amigo knows how to handle his prescription pick-up, and it runs smoothly every time. I’m pleased to see that you’ve switched to small paper bags, too, instead of the small single-use plastic. Remember when I mentioned that I’d be drowning in those bags if I took one every time? Now that my prescriptions get packed in paper, I might accept a bag now and then. We narrowly missed an odd experience last time we came to your store. As we pulled in, I saw something lying in the road. Two cars had just pulled in and the drivers got out to talk and look at whatever it was. We noted this, also noted that it seemed under control and we hadn’t witnessed any kind of accident, so we went into the store to pick up Amigo’s order. When we came out, I noticed that the vehicles and the object in the road were both gone. As I turned on the car and my phone (to catch a Pokemon and the Poke-stop in the parking lot, if you must know), a police car pulled up. He came over and asked if I knew anything about an old man lying in the road. I told him what I knew, which wasn’t much, but I hope it was enough to help him follow through. And then we came home. All things considered, Pharmacy, you’re doing right by your customers now. We’ll keep coming back. By the way, that wrapping paper on clearance? The rolls in the nearby high school colors? Bring those out again near graduation. It’s all about the marketing. We’ve learned quite a bit about making our own apple cider in the past few months. No matter how much we make, it won’t last long. I looked into recipes and processes for making hard cider. I considered other “flavors” such as cherry and rhubarb infused cider. Hahaha! Fresh apple cider is incredibly delicious. Chuck and Amigo drink it in place of orange juice at breakfast. I heat some up after school instead of an instant cappuccino. We froze a few containers, only to thaw them a few days later. Nothing is better than fresh apple cider. Pasteurizing apple cider on a plain old fashioned kitchen stove is easier than you might think. Details: I did a lot of surfing on sites like the USDA and the CDC to find information about home pasteurizing for cider. The results were consistent: heat to 160 degrees Fahrenheit, and maintain that temperature for 6 seconds. 6 seconds? Is that all? I maintained it for a full minute, just because. There are more people making their own cider than I thought! Amigo offered up some of our homemade apple cider for a barbershop chorus celebration, and several of the guys in the chorus let me know that they, too, press their own cider. One or two talked about antique cider presses. Another talked apple varieties; we like ours a little more tart, so Macs are the main apple. That, and the tree outside my office that I pick for free, keep the recipe pretty straightforward. A few buckets of Macintosh apples and a few pounds of something else will make a tasty mix. I found this out by accident when I bottled a batch of cider and then realized I hadn’t added any sugar. Any. Sugar. At. All. And – it was delicious. Maybe it was the Honey Crisps, or maybe I’m just getting used to having my apple flavor straight, no chaser. Next year, I’ll be more aggressive in foraging for apples earlier and oftener. Er, more often. I learned that orchards keep boxes or buckets of “seconds” or “imperfect” fruit, and that fruit is still delicious. If I can make friends with a few people who have apple trees and don’t pick them – don’t laugh, it could happen, just like the tree outside my office building – I can procure enough for a large batch of cider. And then there are pears. I know at least three people with pear trees, all of whom seem to have excess pears come September. Pear cider – why not? In a typical year, putting the garden to bed for the winter has been a pretty straightforward task. Harvest the last of the vegetables, dump any containers into the garden to enhance the soil, spread compost, sit back and enjoy the late autumn rains. Oh, I forgot leaves. Rake leaves into the garden or compost bins. The past few years have been different. Snow has come later – December, even after Christmas two years ago. The last frost, the one that finally kills off the annuals and freezes the allergens, has been later each year, too. Sometimes I’ve looked outside and wondered if I might still have fresh tomatoes if I hadn’t put the garden to bed already. This year, I’m still cleaning up the tomato plants. It wasn’t a good year for tomatoes, anyway. But I put in a second planting of lettuces and another batch of peas. I’ve been able to cut several batches of lettuce in September, and the peas are growing well – now, in October. Green beans have been prolific, too. Every time I pick beans, I notice more blossoms that will be more beans if temperatures stay warm. Herbs are doing well in their containers on the deck. I plan to bring them inside as the frost nears and see if they can adjust to growing indoors. My grow lights might help. I have a few volunteer tomato plants, too. They turned up in a random part of the garden where I have never grown tomatoes. I tossed the smallest of those into the compost and transplanted the bigger ones into containers. I have no idea how they’ll do, but I might bring them inside, too. I have no idea when the final killing frost will happen this autumn. I don’t know if this is the new normal of climate change, this late fall and delayed winter. Whatever the weather, we’ll weather the weather, whether we like it or not.